This is one beautiful piece of furniture! 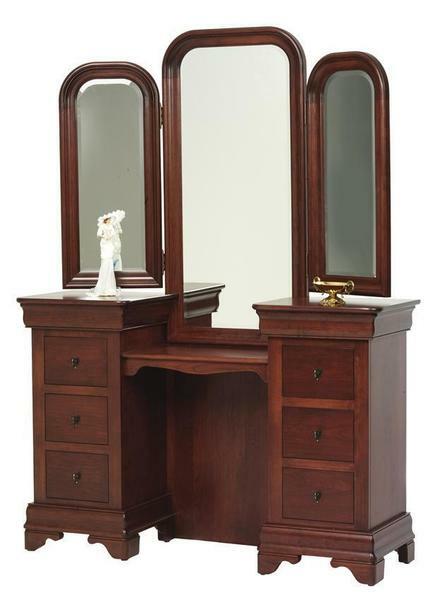 Handcrafted by highly skilled Amish woodworkers, using hand selected hardwood, no two vanities are exactly alike. In conjunction with the use of hand selected hardwood, the Amish's tried and true bench-work methods ensure that this piece will be around for generations. The Louis Philippe Vanity features three beautifully beveled glass mirrors, two hidden felt-lined jewelry drawers and fully extending smooth-motion drawer slides. You can always expect the best from our Miller Bedroom Collection! If you have a question about this collection, please call one of our specialists toll-free at 1-866-272-6773.